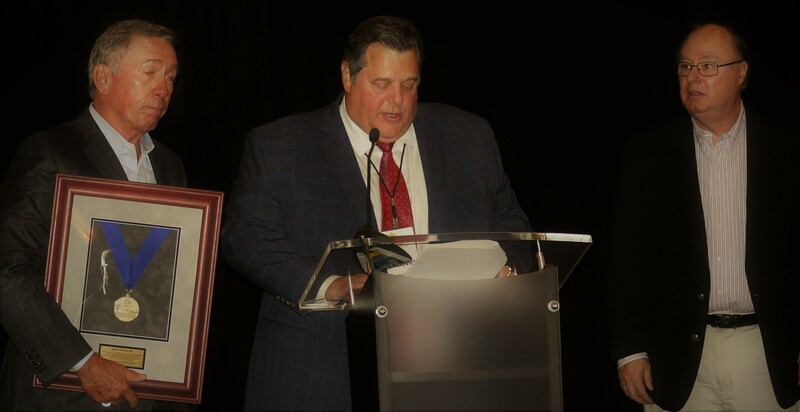 The evening of Tuesday, May 1, 2018 during the annual meeting of FBA and the day of the International Corrugated Packaging Foundation’s (ICPF) spring Board meeting in Palm Beach, Florida, Jim Porter (WestRock President of Business Development and Latin America) was inducted as the 24th member of the International Corrugated Packaging Foundation's Circle of Distinguished Leaders. Through the assistance provided to ICPF by WestRock, the corrugated packaging industry and Jim's family, the lifetime recognition was received as a total surprise to Jim. Jim was nominated for induction by firms that made donations in his name to support ICPF. To date, these include WestRock, Akers Packaging Service, Buckeye Corrugated, Inc., Central Package & Display, Gerber Technology, Great Northern Corporation, Green Bay Packaging, Greif, Jamestown Container, Landaal Packaging, Liberty Diversified International, Menasha, Pacific Southwest Container, Pratt Industries, Schwarz Partners, Sumter Packaging, FBA, AICC, AF&PA.